It’s slowly becoming more clearly that Canadian financial institutions received massive bailouts, all-the-while maintaining that everything was just peachy. A report from EconomicReason.com takes a look at how Canadian banks were bailed out in 2008 and early 2009. More importantly, they review how the Canadian banking system is still exposed and how we may actually have a riskier lending environment than other countries. Canadian politicians pretending that nothing happened and that we’re actually the most sound financial system in the world. We need more truth on this issue, particularly since most bank CEOs hauled in record bonuses and pay checks since 2008. 2012 was the year of political fallout, grounded by corruption, in Canada and elsewhere. Corruption was the real story of the year. Don’t buy what the privately-held mass manipulators want us to believe. Magnotta who? Municipal: more mayors than ever were either turfed from office or should have been because they were pilfering from local taxpayers. While I’m excited to see the likes of Rob Ford getting roasted by the legal system, it’s important that we as citizens keep up the pressure on local corruption and support an objective host of judges. Provincial: In Ontario, we had to suffer through another year of Dalton McGuinty’s corrupt Liberal government, as it floundered through Ornge, health care issues, removal of basic human rights and so on. In Quebec, student protests and other actions brought down the Charest government in a humiliating defeat against the re-born separatists. Federal: I could go on for some time about the collapse of credibility of the Stephen Harper Conservatives. And will. Jim Flaherty’s complete show of hypocrisy every time he opens his mouth is frustrating, to say the least. This man in incapable of running the finances of the federal government and yet has the gall to continue to lecture other ministers at the provincial level and on the international stage about fiscal management. The man is a fraud and should be fired for perpetuating the absurd myth that Conservatives are better managers of budgets as opposed to liberals or progressives. 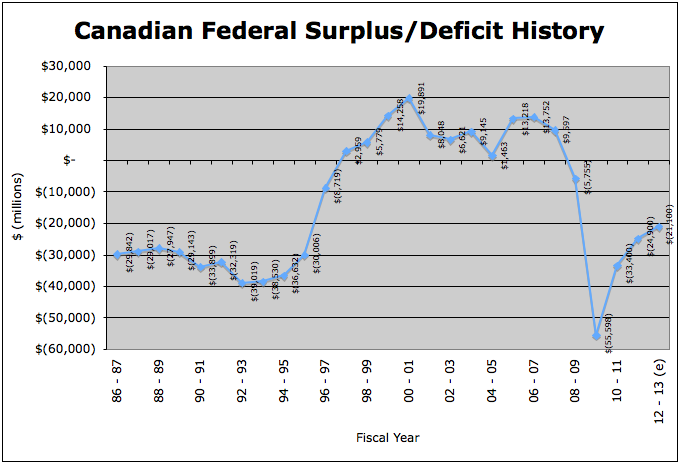 Since coming to office through stolen elections, the Conservatives have turned a $16 billion surplus in 2006, with the total debt actually GOING DOWN to a massive increase in total debt since 2006. 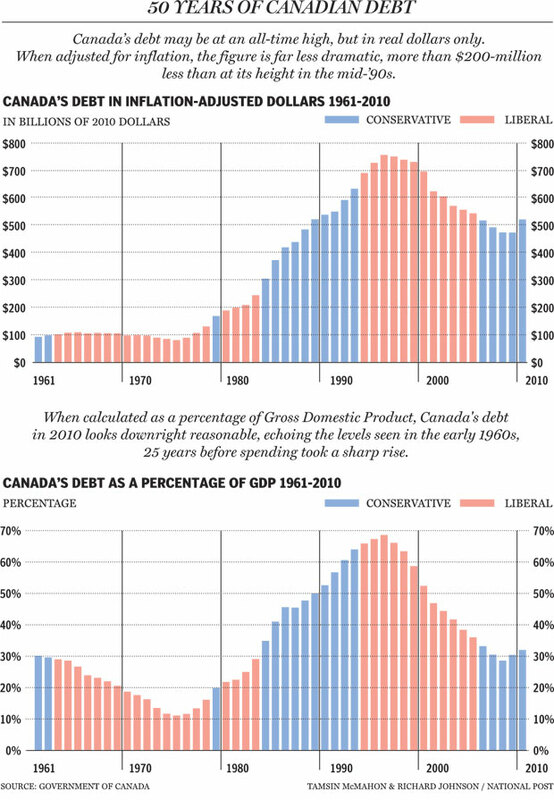 Fact: total debt in Canada has increase from roughly $520 billion in 2006 to more than $670 billion projected for 2013-2014. The F-35 debacle. Defense Minister Peter Mackay has not only sold us out to a gaggle of war mongers to the south, he’s been at the forefront of lying to the Canadian public (along with all of his other cronies) about the true costs of the F-35 program that we don’t need and can’t afford, regardless of the ‘final’ cost. Of course, as the bills were being tallied for something we haven’t even begun to purchase, the Department of Defense wins a ‘hidden turd’ award for planting a big increase in budget with recent news, despite the fact that they were being roasted left, right and centre. In fact, evidence shows that Peter Mackay used valuable public resources to investigate critics of the lavish and wasteful F-35 program, long before finally admitting that the Conservatives need a ‘reset’ on this issue. Look … I could care less about the future of the Tar Sands, but the facts are the facts: we’ve sold a substantial portion of the Tar Sands to foreign holders without any right to control or profit from these sales. Canada is now essentially in the hands of the Chinese, Dutch, Norwegians and Americans and we’ve lost the autonomy of our government to oil barrons. The greatest concern is the depth of this story. Some people go from very raw emotion about the sell-out of Canada’s resources to foreign, Communist interests, to the more subtle investigation being put forward by the likes of the Tyee. That said, there’s something extremely unnerving about the whole situation and Canadians need to find a way to put themselves first. Now. The depths of corruption in Quebec are a simple example of how endless piles of ‘Economic Action Plan’ dollars were funneled from the pockets of Canadians to the pockets of crooks. We see hints of how the connections are close to the Harper Regime, but we’ll never get the truth about this situation because our media is run by a pack of those folks that just want us to subscribe to their services and look away while we’re being robbed. The facts have shown that they’ve cheated in every election. In Spring of 2011, a federal court found that Harper’s Conservatives willfully violated the $18.3 million election spending limit, during the campaign which originally brought them to power in 2006. 4 Conservatives (including 2 Conservative Senators) currently face charges and possible jail time. The Robo-Call scandal is just the latest of scandals that continue to surround the Conservative Party of Canada. This is the scandal to beat all scandals as far as I’m concerned and if corruption wasn’t the lead story of the year, this should have been. Canadians had their democratic rights stolen and destroyed by people with deep pockets. Canada was the first country to officially withdraw from the Kyoto Accord. While technically not an indicator of corruption, it falls squarely in the camp of the Harper Regime being lead by one special interest party (Big Oil) as opposed to an array of voices from different organizations and wealth levels. Everyone is a criminal, unless you’re a Conservative. This is a fundamental doctrine that has to exist in order to justify the bloated prison budgets that will be handed down to the provincial levels. Canadians need to be alert to this kind of scare-mongering. Hints of Conservative disdain for anyone with a point of view beyond the texts of Milton Friedman, Karl Rove and Nicolo Macchiavelli were apparent long before they even came to power, but recent efforts to label every walk of life with ‘terrorist’, ‘enemy of the state’ or ‘radicals’ reek of fascism and despotism. Again, this doesn’t directly translate to corruption per se, but does set the foundation for a government bent on destroying the fundamental rights and freedoms of Canadians. We should all be very concerned we live in a country where protest = prison. Throughout Canada, there are still people that believe the lies the Harper Regime told us about their plans to end the raft of patronage appointments throughout the halls of government control. I hope you don’t mind my pointing this out, but you’re all fools since you believed this and voted for it. As it stands, Stephen Harper has appointed more than 1,000 friends, buddies, losers of elections and other cronies to the halls of Canadian government, all with a specific strategy in mind: ensure that it will be decades before an objective government can run the country of Canada again. Most of these appointments are arranged during illegal or questionable ‘breaks’ with the House of Parliament, on weekends or during holiday breaks, ensuring that the already complicit mainstream media does its best to ignore the endless array of appointments by Stephen Harper and his crew. It’s unlikely that we’ll see any true change in 2013, but the cracks are starting to show. The Cons will not be able to hold things together much longer as long as passionate and dedicated Canadians focus on just how bad Stephen Harper and his crew are for ALL of Canada. However, only the people that actually voted for the Conservatives can really bring about the change that we all deserve. You must wake up from your slumber and realize that you’ve been lied to, manipulated and duped. I know this is a delayed reaction. Several days of being stunned held me back. Canada is one of the few countries that has reversed legislation related to gun control. I question the sanity of those that support assault rifles and larger weapons in defense of freedom and hunting. You register cars, marriages, births, new companies and a thousand other things. Why do you resist registering weapons? But the issue isn’t just about weapons, isn’t it? The elephant in the room is the topic of mental illness. Billions are made each year on psychotropics medicines and this issue is ignored while passions ignite about gun control.